Gastroesophageal Reflux Disease, What Is It? 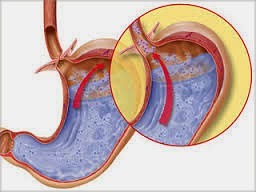 Gastro-oesophageal reflux disease occurs when acid from the stomach comes back up into the oesophagus (the food passage from the mouth to the stomach). The main symptom is heartburn. About a third of adults in the UK experience heartburn at least once a month, and a small minority suffer from heartburn every week or even every day. Most pregnant women have heartburn which settles as soon as the baby is born. Reflux is also a problem in some young infants, but usually disappears as the baby grows and develops. Fortunately, for most people reflux can be treated by making simple changes to their lifestyle. At the top of the stomach there is a muscular valve (sphincter) that allows food to go down but prevents the contents of the stomach from coming back up into the oesophagus. If this valve isn't working properly, stomach acid comes back into the oesophagus - this is called reflux. We don't know why the valve doesn't work in some people, although a hiatus hernia (where the upper part of the stomach is in the chest) makes reflux more likely. • Coughing and wheezing Heartburn is the most common symptom and often comes on after meals. • Regurgitation of stomach fluid into the mouth, often when bending over or stooping. • Food occasionally sticking in the lower end of the oesophagus. • A burning pain on swallowing, usually with hot fluids. A small number of people have severe chest pain brought on by reflux. This pain can be mistaken for a heart attack. Some symptoms may be caused by a more serious problem, be sure to see your doctor if you experience any of the following. • Heartburn for the first time and you are over 40 years old. Sometimes special tests are needed to confirm that you have reflux. Your doctor will tell you if this is the case. The most useful test is called an endoscopy (or gastroscopy). This test involves a small, flexible telescope being passed from your mouth into your oesophagus and stomach. This test is very accurate and can detect subtle changes of reflux as well as ulcers (a break in the lining of the digestive tract). Another method is a barium meal, a test that can detect a hiatus hernia and ulcers of the oesophagus. It involves swallowing a white liquid called barium while X-rays are taken. It is safe and painless but less sensitive than an endoscopy. It is most useful for seeing why food sticks in the oesophagus. For other, more unusual cases and when surgery is being considered, your doctor may arrange for you to have studies that measure how the muscles in the oesophagus are working, or record the amount of acid in your oesophagus. How your oesophageal reflux is treated depends on how severe it is. Mild symptoms in a young person can be treated simply, without lots of tests, while more severe symptoms should be assessed by a doctor. You can also try taking antacids which you can buy from your local pharmacy or supermarket. They are widely used for instant relief of heartburn and work very well for mild, infrequent symptoms. If you need to take antacids every day, see your GP as you may need stronger medications to prevent symptoms. These will reduce the production of acid in your stomach or stimulate the muscle in the oesophagus and stomach (which helps push the acid back into the stomach again). These are also available from pharmacies. The choice of medication is best made by your GP. You may need to take the medication on a long-term basis because it controls the condition rather than cures it. Always ask your GP if you have any questions about it. For more information, send a stamped addressed envelope to: Digestive Disorders Foundation, PO Box 251, Edgware, Middlesex HA8 6HG.